Thank you for your interest in the first-ever Voices of Orange talent competition! This year’s competition is now closed. The winner will be announced in the weeks ahead. 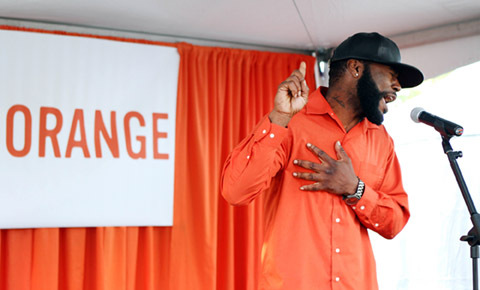 To learn more about Wear Orange, a movement inspired by Chicago teens who refused to remain silent in the fact of daily gun violence, go to wearorange.org. This contest is part of a partnership between Everytown and Street-Level Youth Media. Voicesoforange.org and related sites on act.everytown.org is a website of Everytown for Gun Safety Support Fund, Inc. This Privacy Statement describes the information collection, use, and disclosure practices of EverytownResearch.org (“Site”). doris s. just signed the Voices of Orange Competition 2016 petition. Edward B. just signed the Voices of Orange Competition 2016 petition. just signed the Voices of Orange Competition 2016 petition. Marquis E. just signed the Voices of Orange Competition 2016 petition. Toni M. just signed the Voices of Orange Competition 2016 petition.